On the afternoon of September 11 at a symposium for the launching of an Okinawa research society of the EAC, former Prime Minister Yukio Hatoyama introduces the establishment of the research society at the University of the Ryukyus. On September 11, a proposed Okinawa research society of the East Asian Community (EAC) was launched at a symposium held at the University of the Ryukyus. Experts from both within and outside of Okinawa called for the society. It was established as a way to extensively research the current state of Okinawa’s right of self-determination, including Okinawan self-reliance and independence. Former Prime Minister of Japan Yukio Hatoyama was brought in as an honorary advisor of the research society. He said he believes that Okinawa’s spirit of fraternity represents the true essence of the concept of an East Asian Community, and that Okinawa will be the starting point for the EAC. When a meeting of the EAC opens in Okinawa, he hopes it will paint a picture that the prefecture will serve as a pivot point toward peace. Professor at University of the Ryukyus Tetsumi Takara, who has assumed a position as representative of the EAC, explained the reason why this research society is being established. 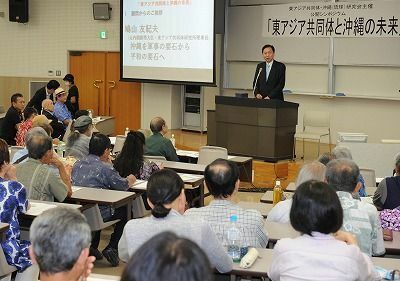 He said that some of the main founding principles of the society are to help break Okinawa out of its current deadlocked condition of struggling with issues surrounding independence and democracy, to receive assistance from outside of the prefecture, and to gain recognition for Okinawa from all over East Asia. The EAC has also taken on Professor Akira Kimura of Kagoshima University as a representative, and former governor of Okinawa Masahide Ota as an honorary advisor. Some of those who gave reports at the symposium on September 11 were Professor Kimura, professor at University of the Ryukyus Jun Shimabukuro, president of Okinawa University Hiroshi Nakachi, emeritus professor at Okinawa University Masaie Ishihara, and Ai Tamaki of SEALDs RYUKYU. Organizers of the symposium included professor at Tokyo Zokei University Akira Maeda, full-time lecturer at Kyoto Seika University Satoshi Shirai, and numerous researchers and journalists from both within and outside of Okinawa. Former Prime Minister Hatoyama serves as board chairman for the East Asian Community Institute, which is a separate organization from the EAC.